Valuable Objects: How much value is there in your paycheck? Values come to life when we tell the stories behind the values. This week, I am sharing family stories men and women have been telling me in an in-person pilot project we’ve been undertaking. As we hear the family stories—we understand the importance of the values in new ways. Often, there are objects connected to these family stories—objects that may be big or small, mundane or rare. The more important the value and the family story—the more precious the object becomes. Today, we consider a common form of money—a paycheck, which conveys priceless meaning. Kathy MacDonald, a participant in our discussion session this week on values, brought in both a paycheck and a chunk of copper ore—and told us a story from 1910. The ore was mined by her grandfather, and the paycheck was his, as well. All her grandparents lived in mining communities in Cornwall, England, and brought their skills to upper Michigan. The check was for $58.60, which was probably a month’s wage. What does a paycheck in 2013 signify? What object tells a story of your values and how you got them? Please, take a moment to add a Comment, below. And invite friends to read along. Use the blue-”f” Facebook icon or the small envelope-shaped email icon. Valuable Objects: Missing photographs, missing memories? Americans today are the most photographed people in history. Smart phones and Facebook make it easy to capture daily images of our lives and share them. Go back a generation or two, however, and photographs are rare. Many are missing, representing gaps in the stories of our families. Do you have a photographic gap in yours? Arlington’s story is a classic immigrant story of people coming here to make a better life for themselves and their families. His example illustrates the values of achievement, hard work, and enterprise. Do you have a story like Jennifer’s? Is there a gap in your family knowledge? What object would you use to tell the story of your values and how you got them? Valuable Objects: What’s the significance of an Eagle Scout badge? Jim Jeffries talks to the group about the values symbolized in his Eagle Scout badge. All of us have objects in our lives that convey meaning and significance. These objects tell stories about our values and how we acquired them. The stories remind us that values are not abstractions, but emotionally invested principles that shape our lives. So, what values are conveyed in an Eagle Scout badge? Yesterday, OurValues staff met with a group of men and women to discuss values—and the objects that signify them. We asked each person to bring a physical object that conveyed their values and how they acquired them growing up. The stories they told were a mixture of love, poignancy, joy, sadness, hope, and resilience amidst trials and tribulations. All were inspirational. We’ll discuss some of their stories this week, starting with Jim Jeffries and his Eagle Scout badge. First, a little background: Eagle Scout is the highest attainable rank in the Boy Scouts of America. The requirements are arduous, and all must be completed before the boy turns 18 years of age. The requirements, according to the BSA site, include “merit badges, service project, active participation, Scout spirit, position of responsibility, and unit leader conference.” Only about 5% of Boy Scouts become Eagle Scouts. Leaders in many fields of American life proudly list, among their accomplishments, having earned the badge, including more than 40 U.S. astronauts, outgoing New York Mayor Michael Bloomberg and filmmaker Steven Spielberg. I recall hiking (and surviving) the Franconia Ridge Trail in the White Mountains, and I know what Jim is talking about. So, for Jim, his Eagle Badge represents the core American values of self-reliance and achievement. What object in your life tells a story about your values? Capitalism: Is it working for you? Artist and activist Steve Lambert designed the interactive Capitalism installation. Click this image to visit Lambert’s website, where he also has posted videos about the project. QUICK! Does capitalism work you? Yes or no? If you’re in Times Square this week, you can register your vote at an interactive art project. If you are not in New York City—please register your vote here by leaving a comment! Artist and activist Steve Lambert’s installation “Capitalism: It works for me!” began yesterday in New York City’s Times Square, and runs through October 9. The lighted display invites passersby to press a green or red button, registering their vote “true” or “false.” Updated totals are shown on the display. Voters can also video record their comments and thoughts. If you were in Times Square, how would you vote? Would you say that capitalism is working for you? Or not working for you? Most Americans say that our system of capitalism is working, according to a 2013 Public Religion Research Institute survey. But only 9% say it is working very well. About 45% say American capitalism is working somewhat. Twenty-six percent say our economic system is not working too well, with an additional 16% saying that it is not working at all well. Not surprisingly, Americans who make a lot of money are much more likely to say the system is working, compared to those who make little money. Even so, almost half (47%) of Americans with annual household incomes of $30,000 or less says that our economic system is working well. Why is capitalism working? Among those who believe it is, the main reason they give is that it encourages personal responsibility (33%). Others say it is working because it provides equal opportunities for all (29%), or that it promotes individual freedom (24%). Why is capitalism NOT working? Among those who say it isn’t working, the main reason is that it encourages greed (34%). Others say that it does not provide opportunities for all (28%), or that it creates poverty (14%). Only 4% say it is not working well because of too much government regulation. The Gift: Come on now … you did get help, didn’t you? Remember the big brouhaha last summer about “You didn’t build that”? In a July 13, 2012 speech in Roanoke, Virginia, President Barack Obama spoke about how public investment helps individuals to prosper. The Romney campaign and the right-wing blogosphere pounced on the phrase, “You didn’t build that.” They made it the centerpiece of their convention rhetoric and the fall campaign and the punchline for a thousand memes. The anger in these attack ads was rooted in American individualism. 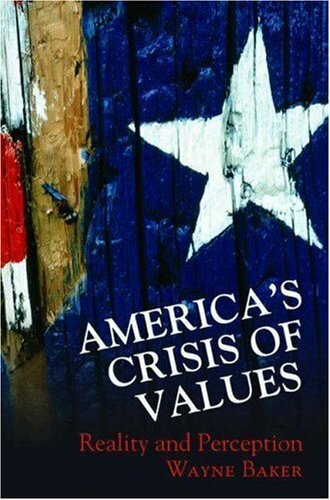 Obama’s remark was a threat to the American core value of self-reliance, which Dr. Baker has written about earlier. But isn’t it true that every successful person got help along the way, and not only from their friends and family, but also from the community? And even, horrors, from the government? To pretend otherwise is like refusing to acknowledge a gift gratefully and gracefully. And isn’t refusing to acknowledge a gift the same as rejecting your community? Please, share this column with friends! Please, start a conversation with your friends by clicking on the blue-”f” Facebook icons connected to this story. Or email this story to a friend using the small envelope-shaped icons. THE PAY WALL: After readers have read 10 free-of-charge New York Times articles in a month, this blue rectangle appears in the center of the computer screen ending the free ride. Next month, you can read 10 more articles for free. What do you think of such paywalls? All that free content on the web? Who pays for that? It’s a crucial topic for news organizations, as more and more of them erect paywalls that require readers to pay for access. On one side, you have the notion that because people have grown accustomed to getting content for free on the internet, they have a right to continue to do so forever. On the other side, you have the argument that journalism is a real job for which people ought to get paid, and it seems perfectly reasonable to make readers foot the bill. It seems to be working. Last year, for the first time in its history, the New York Times made more money off of circulation than advertising, thanks mostly to rapid growth in paid subscribers to its web site. But what about all that other content that’s still free on the web (like Read The Spirit), created by writers, editors, artists, video producers and others who also are interested in making a living? Why do they give it away for free? Maybe as readers, we should look at is as a gift. Does reading a post like this make you feel like part of a community? Second Acts: Are we caught between past and present? Photograph of a workman on the framework of the Empire State Building as it was rising. The Chrysler Building already is below and behind him. Photo taken in 1930 by Lewis Hine, released now into public domain. What did F. Scott Fitzgerald really mean when he wrote “There are no second acts in American lives”? Did he mean that no one gets a second chance, or is the line meant to be read as a type of theater criticism, that Americans are so impatient to cut to the chase that we miss out on character development. Maybe there’s another way to look at it. The sentence was found in the notes Fitzgerald left for the unfinished work, The Last Tycoon, published not long after his death in 1940. “But it actually dates back earlier, to about 1932, where it’s used in a very different way, and I think that way is probably more in line with Fitzgerald’s thinking throughout his life,” scholar and author Kirk Curnutt said in an interview on NPR in May. Can we shake the burdens of the past? Even if we go on to a brighter future? And, share this column with friends! Please, start a conversation with your friends by clicking on the blue-”f” Facebook icons connected to this story. Or email this story to a friend using the small envelope-shaped icons.